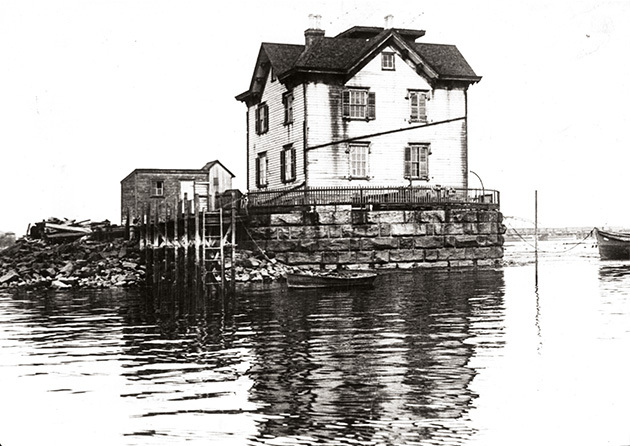 Officially, this landmark was designated as the Passaic Light Station. For more than six decades it guided shipping in Newark Bay.An early advocate for its construction was Michael Nerney who previously was a member of the Newark whaling expedition aboard the John Wells, which sailed with its sister ship the Columbia, into the Passaic in 1837. On returning to Newark, Nerney and others pressed Congress for an appropriation to build a lighthouse that would safeguard Newark shipping interests. This was finally realized on March 3, 1849. The lighthouse was constructed in 1849 at a cost of $5,000. It was a two-story frame structure 'mounted on a quadrangular cribwork wharf partly filled with stone and sheathed on the outside with four-inch planking placed vertically.' At high tide, the wharf rose 6 feet above the bay surface. A tower atop the keeper's house contained six sperm-oil lamps with a 15-inch reflector. The light could be seen for 10 miles at sea. During Nerney's tenure as lighthouse keeper, he kept careful records of vessel traffic that showed an average of 100 vessels passed the light daily. A few years later, an additional congressional appropriation of $250 provided for a fog bell that warned approaching ships of the nearby mud flats. Because of continued bad winters in the 1850s, the whole structure was rebuilt. Its foundation was reinforced, the keeper's house was enhanced and the light tower was enlarged. Over the years, Nerney became a well-known and popular character as well as a spinner of tall tales. Boat crews frequently stopped by just to say hello. In 1870, Nerney left the lighthouse service to take up residence at 189 River St. in Newark, where he later died. Following Nerney's retirement, several others tended the light. In September 1881, Dennis MacCashin took over the position. The MacCashin lighthouse dynasty spanned the period from 1881 through 1915, when the United States government closed the facility. MacCashin, an Irish patriot, settled in America just in time to become involved in the Civil War. By 1881, he'd taken over as tender for $600 per year. With him came his wife, Eliza, daughters Elizabeth and Hettie, and son Hugh to live in the lighthouse. Upon his death in 1903, Eliza became the light's last keeper. During the MacCashin years, great changes occurred in the bay. The two-, three- and four-masted schooners were gradually replaced by steam boats. A great deal of the fishing industry disappeared. No longer was the bay the center for oyster, pickerel, fluke, shad and bass harvesting. And steamboats and tugboats replaced the more graceful sailing vessels. The most serious change occurred with the narrowing and moving of the channel. No longer did the old light warn the approaching boatmen of the river and bay hazards. It had actually become a hindrance to the sailor. Added to all these changes was the heavily polluted water. As a result, on April 14, 1914, four acetylene lights, named Centerville, Ramapo, Salterville and Junction Lights, replaced the Passaic Light. Even the annual $600 salary disappeared. Eliza MaCashin's remuneration was reduced to the grand sum of $1 per year to serve as custodian of the Passaic Light Reservation. The dollar commission passed to Hugh MacCashin on his mother's death in September 1914. In 1935, when Hugh failed to arrive on one of his weekly trips for supplies, police found him gravely ill and removed him to a Jersey City hospital. A few nights later, the old house was broken into and it was reported that 'flames from the lighthouse ruins flickered all night long. Only the two chimneys were left standing by the blaze of August 16, 1935.' Thus ended an era when Newark had its own lighthouse.